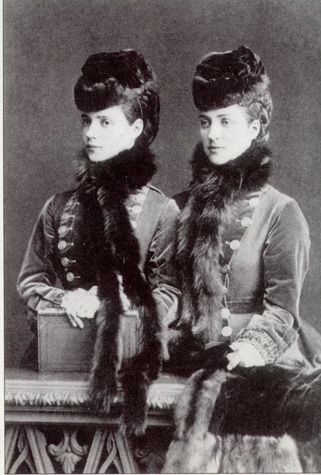 Grand Duchesses Elena and Alexandra Pavlovna were sisters, born only a year apart. They shared not only their parents but their destinies. They were both married as a teenagers and they both died young. c. 1795-1797. 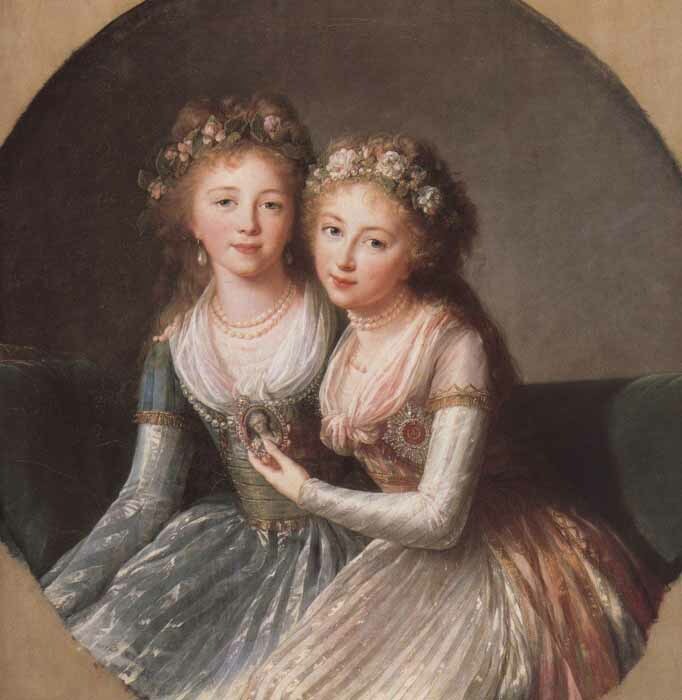 Grand Duchesses Alexandra and Elena Pavlovna by Louise Elisabeth Vigee Le Brun. Alexandra was born on 9. 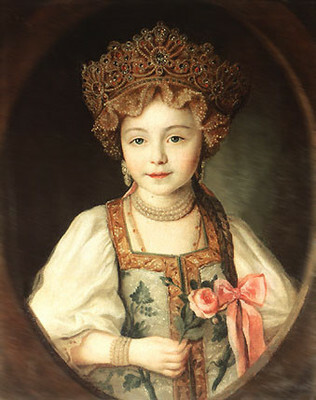 August 1783. in Tsarskoye Selo as a third child and a first daughter of Maria Feodorovna (Sophie Dorothea of Wurttemberg) and Paul I. of Russia. 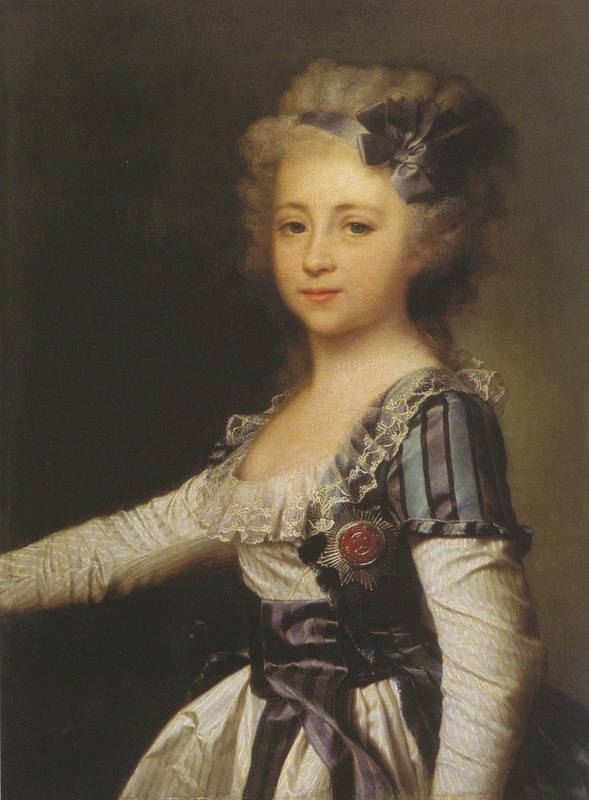 Her younger sister Elena was born on 24 December 1784. in Saint Petersburg. The two sisters were very close and they were often painted together. They received a typical education of a Russian princesses, focused on music, languages and art. 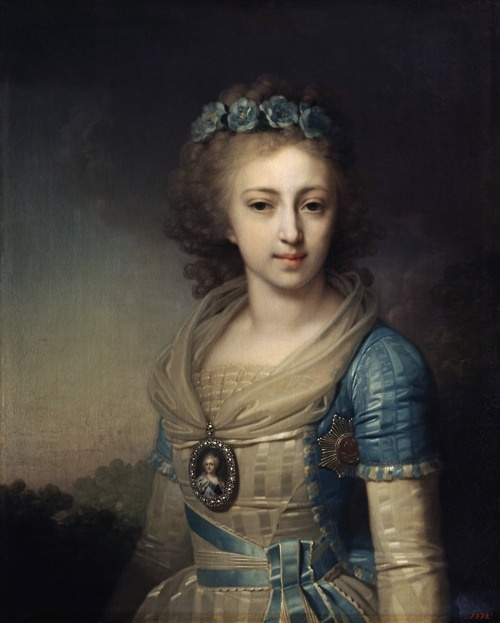 Grand Duchess Elena was very beautiful and her paternal grandmother Catherine II. named her after the famous Helen of Troy. Alexandra’s beauty is evident even on the later portraits. In the portrait above she’s shown on the right. 1790. 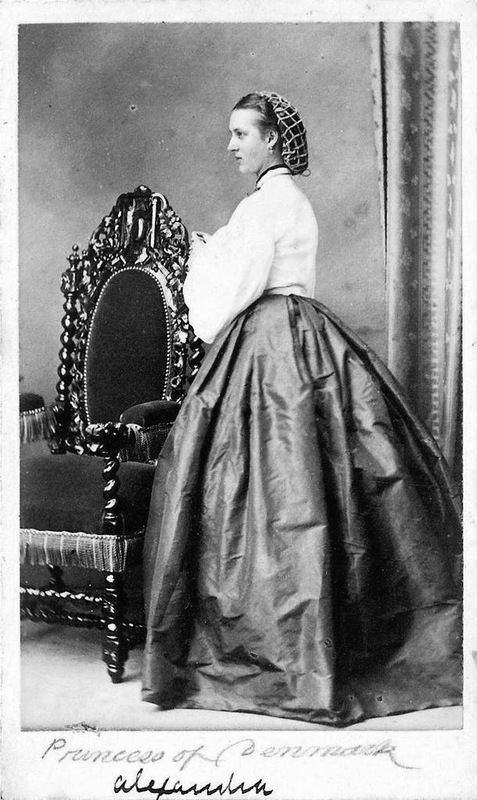 A little Grand Duchess Alexandra Pavlovna dressed in kokoshnik and sarafan. Unfortunately, their innocent childhood was interrupted by marriages. Alexandra married Archduke Joseph of Austria on 30 October 1799. Her younger sister Elena married Frederick Louis, Hereditary Grand Duke of Mecklenburg-Schwerin on 23. October 1799. Alexandra was sixteen years old at the time and Elena only fifteen. When the marriage negotiations started for Alexandra, her paternal grandmother wished her to marry Gustav IV of Sweden. That would have solved the political problems between Russia and Sweden. The young king indeed came to visit his future wife, as he had thought. 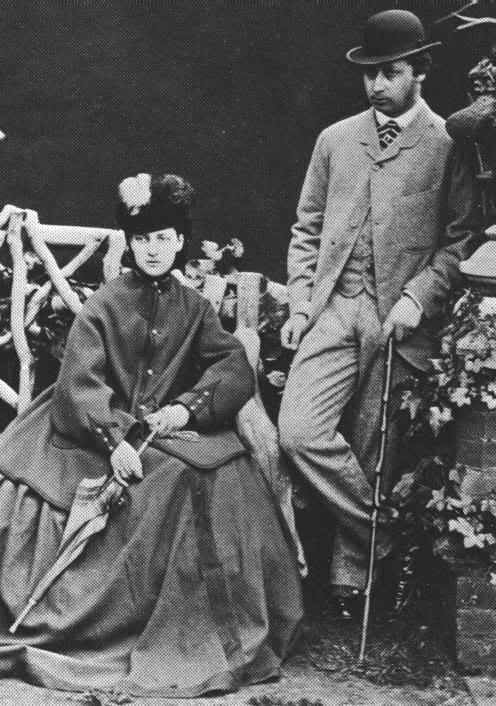 Alexandra and Gustav had fallen in love at first sight. He declared his love to her and went instantly to ask for her hand from the Great Empress Catherine II. Empress was delighted but the question of religion was overlooked and that would cause serious problems later on. While reading the marriage contract, Gustav noticed that Alexandra was to keep her Orthodox religion. 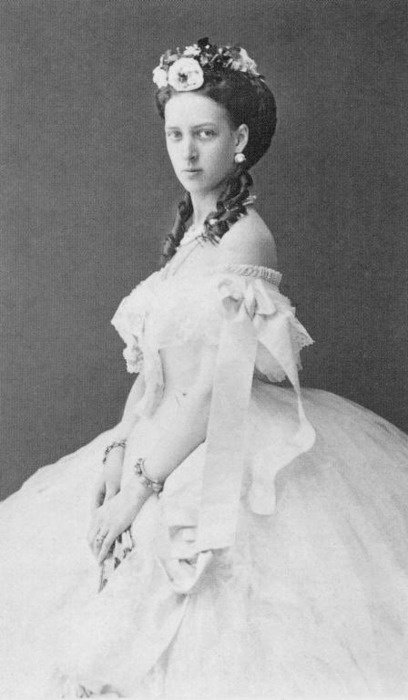 Furious, he broke off the marriage contract and a year later married Princess Fredericka of Baden, younger sister of Elizaveta Alexeievna, Alexandra’s sister in law. 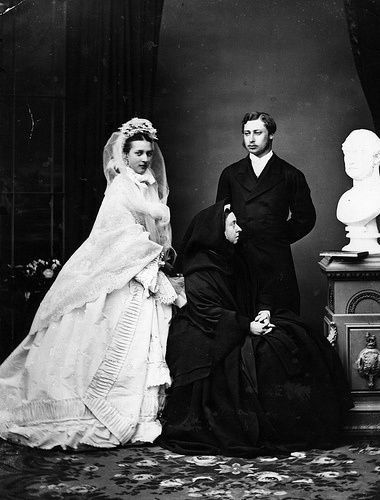 Alexandra was grief-stricken, but three years later she was married off in Austria, in order to cement the alliance between Russia and Austria. 1796. 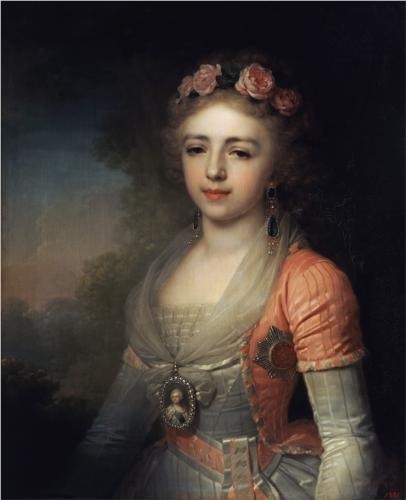 Grand Duchess Alexandra Pavlovna by Vladimir Borovikovsky. Her life at the Austrian court was more than difficult. Empress Maria Theresa, second wife of Emperor Franz II, was jealous of Alexandra’s beauty and fine jewels she brought with her from Russia. 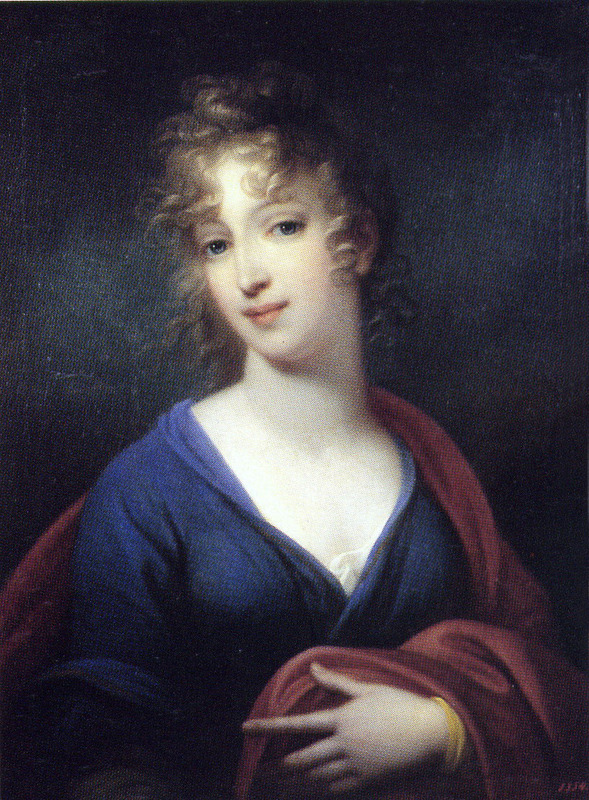 On top of all that, Alexandra greatly resembled Franz’s first wife, Elizabeth of Wurttemberg, who was Alexandra’s maternal aunt. Alexandra died on 16. march 1801., a year and a half after the marriage, of puerperal fever after giving birth to a daughter who died the same day. Her early death and her father’s murder at the same time were terrible blows for the Romanov family. In the late 1790s Elena was betrothed to Frederick Louis, Hereditary Grand Duke of Mecklenburg-Schwerin. The marriage took place in palace of Gatchina on 23. October 1799. 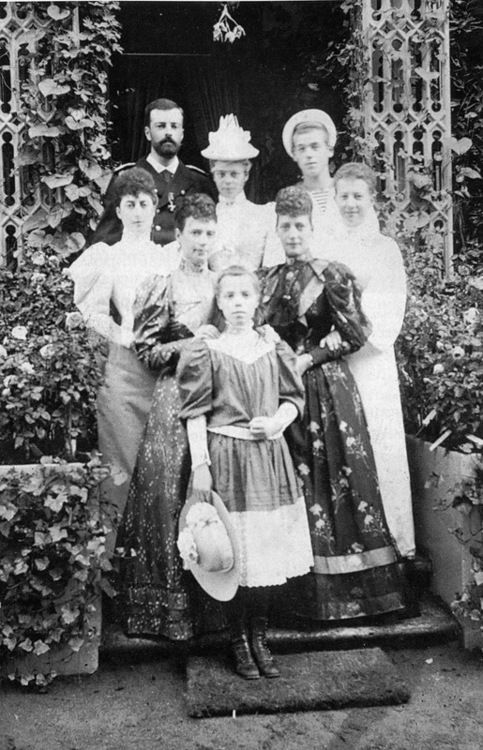 It was a custom for princesses to travel to their husband’s land to get married, but Russian Grand Duchesses were an exception. 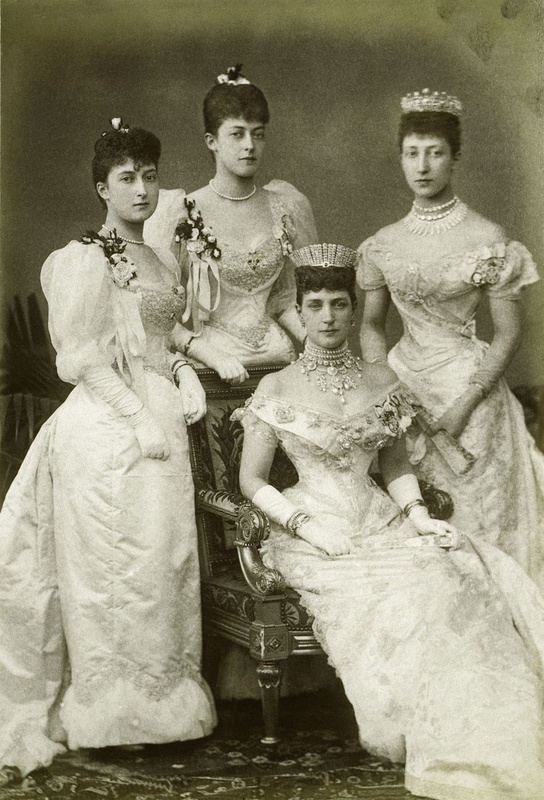 Tradition for them was to get married in their homeland as both Elena and, Alexandra a week later, did. Elena and Frederick had two children. Their first child, a son, was born less than a year after the wedding and their second child, a daughter Marie Louise, was born only six months before Elena’s death. 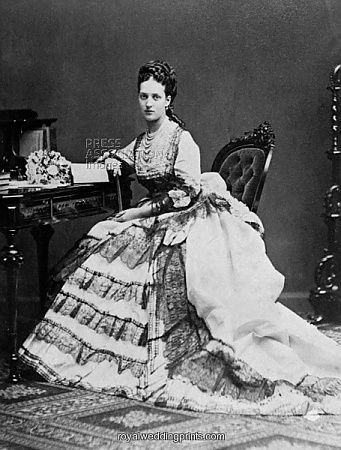 Elena named her daughter Marie after her mother Maria Feodorovna. Their son, Paul Friedrich, was named after his grandfathers; the Tsar of Russia and the Grand Duke of Mecklenburg-Schwerin. Elena found the new court in Schwerin quite different from the opulence of Saint Petersburg. As opposed to Alexandra, Elena was content with her marriage life and was even happier when the baby arrived. The year 1801. was extremely difficult for Elena; her loving and dearest sister Alexandra died and her father was assassinated. Elena died suddenly on 24. September 1803. after she’d fallen ill the same month. She was buried in Helena Paulovna Mausoleum, named in her honour. 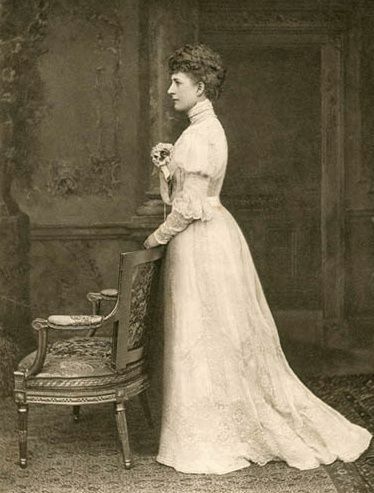 Her husband, although deeply in sorrow, married seven years later to Princess Caroline Louise of Saxe-Weimar-Eisenach. He had three children with her and eventually died in 1819.; sixteen years after his loving first wife. I hope you found this story and tragic destinies of these unfortunate sisters as amusing and fascinating as I did. 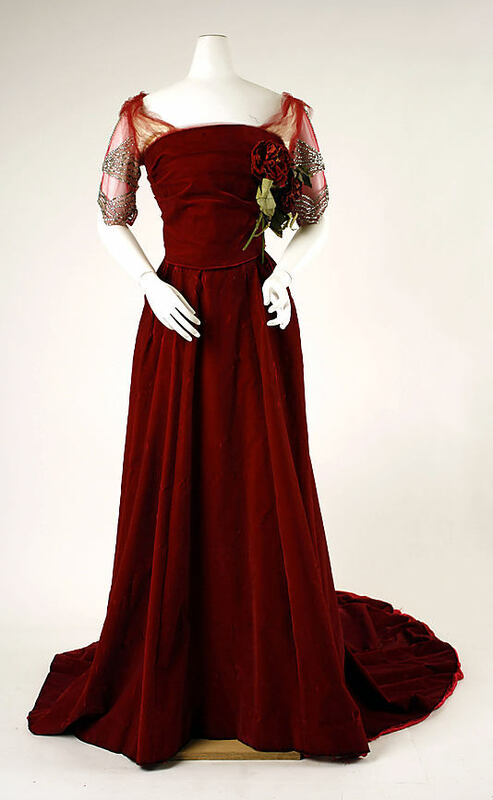 Ruby red evening dress, 1898. This evening dress is perfectly suitable for this festive time of the year so I decided to share it with all of you! I instantly imagined a rich aristocratic lady attending a Christmas dinner or ball wearing this amazing evening dress created in 1898. by Jean Philippe Worth, son of Charles Worth. Though the cut is simple, the colour is rich as it could be. In fact, one of the characteristics of 1890s fashion are rich jewel tones. Skirt itself is fluid, elegant and neat but sleeves made sure that the whole appearance isn’t to neat and plain. I love the silver thread decorating the sleeves. The roses on the bodice are a hint of the Edwardian era fashion. This dress came as a last scream of the 1890s fashion and only two years later fashion took another direction that favoured pastel colour and abundance of lace. I love all the fashion eras and I’m addicted to historical evening dresses, but the ones that caught my attention the most were the 1850s and 60s evening dresses. 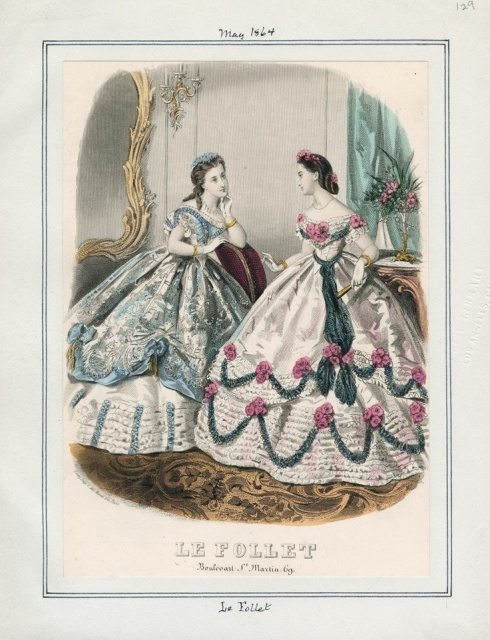 Besides the silhouette I love fabrics, colours, trimmings and elegance and good taste that pervades the evening dresses of the crinoline era. 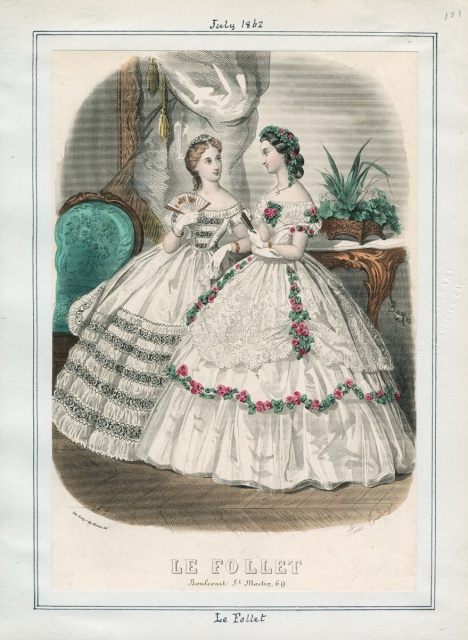 Crinoline era is an era of fashion reign of empresses Elisabeth of Austria and Eugenie of France. 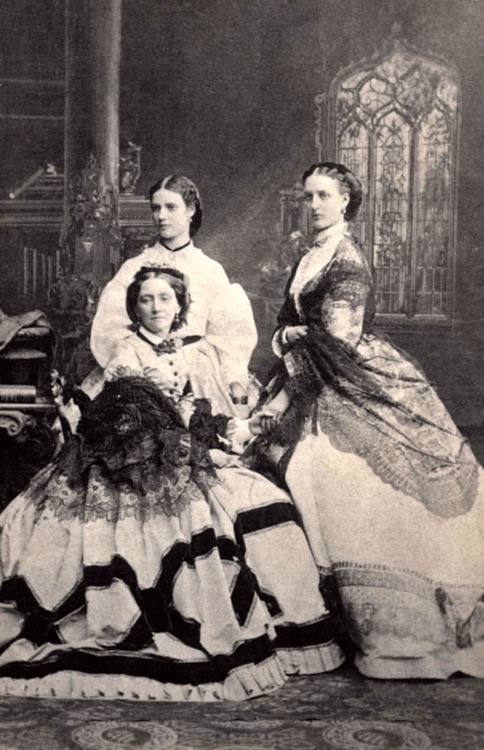 Can you imagine Empress Eugenie or Elisabeth wearing these kind of evening dresses? 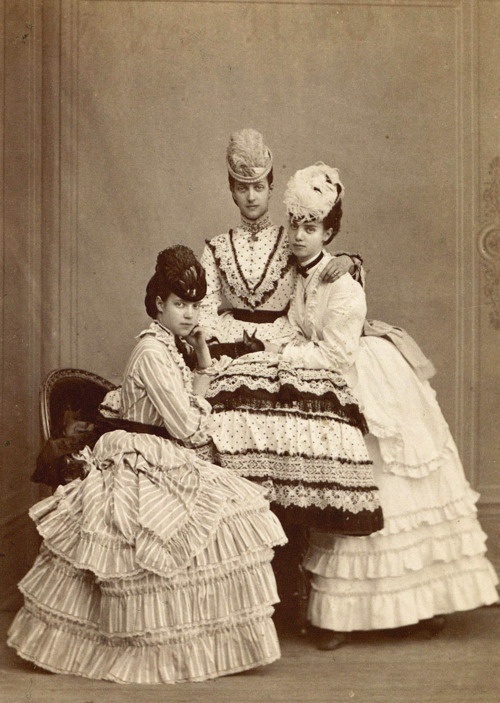 I love the crinoline era and the elegance, opulence and luxury that comes along in fashion. Who among you can resist these beautiful evening and ball dresses? I know I can’t. 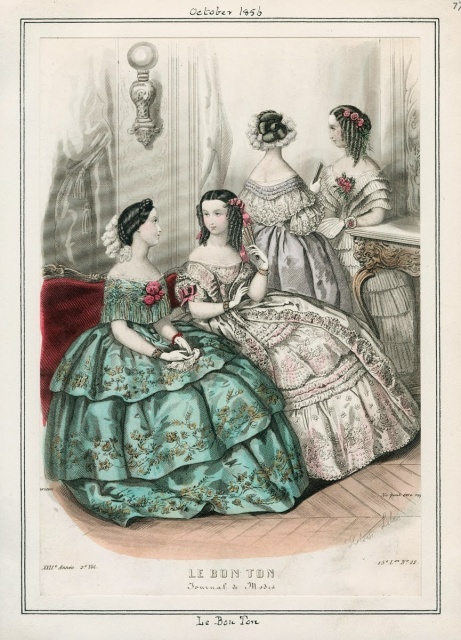 In this post I’ll explore the evening fashions from 1855. to 1865. – The crinoline era, to be precise. 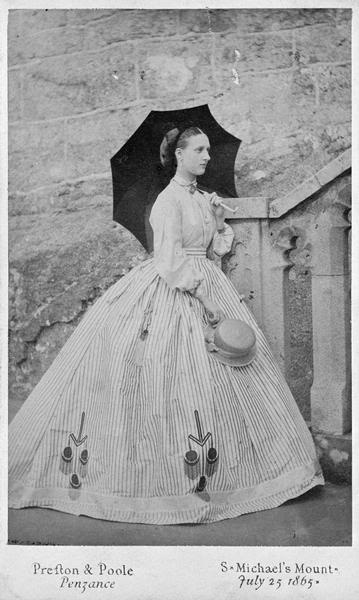 From 1850s skirt were becoming wider and wider and were supported by vast amount of petticoats until finally crinoline was invented in late 1850s. Though the silhouette in this era is basically the same, there are some differences between late 1850s and early 1860s styles. 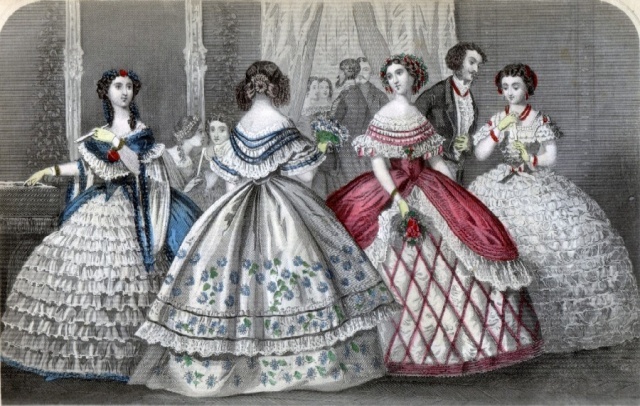 Late 1850s skirts have lots of flounces and the sleeves are much more elaborate and wider in shape, often decorated with flounces, lace or opulent trimming. On the other hand, early 1860s styles are toned down and simpler; sleeves are less elaborate and skirts have one or two flounces if any. The neckline was open, revealing the shoulders. Sleeves were short and usually puffed but came in variety of shapes; petal, puff, flutter, bell, cap, basic short, gathered, petal and puffed combination, cap and puffed combination. Neckline was usually decorated with lace, flower bouquets, jewels or single flowers; roses were quite popular. Little bouquets were often asymmetrically placed on the skirt. 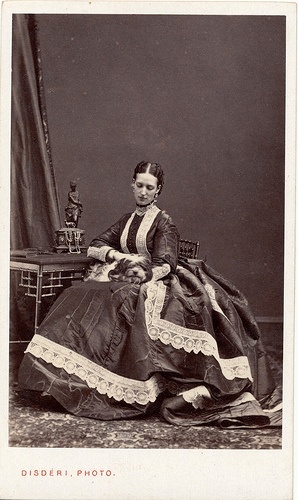 Main decoration of the late 1850s skirts were lots of flounces and the sleeves often have visible renaissance or Gothic influence. 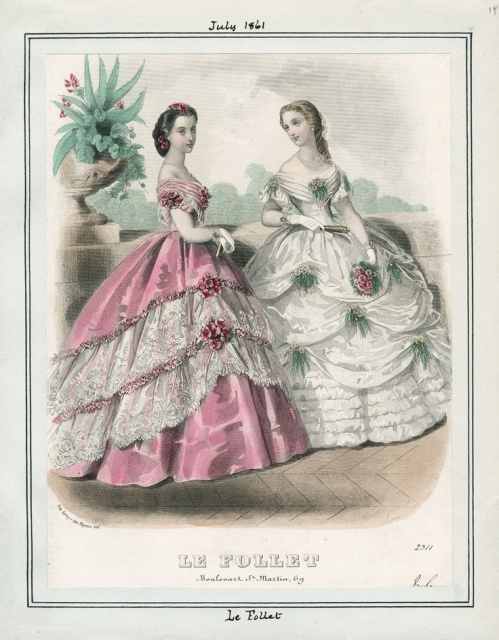 Most used fabrics were silk, taffeta, moire, organdie, muslin, tulle and lightweight brocade. 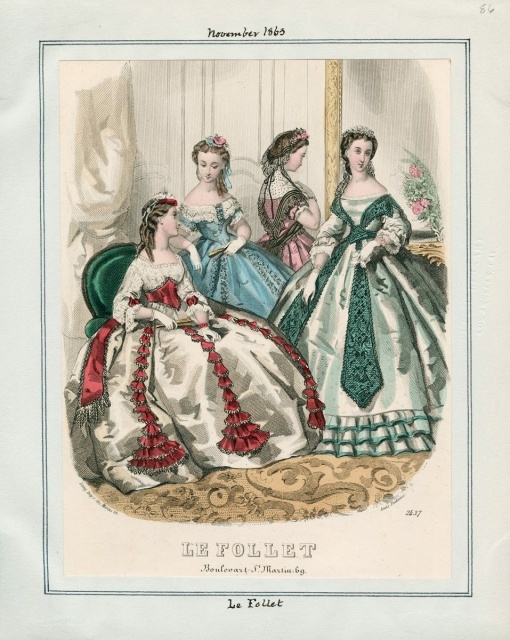 Colour palette depended on the age; debutantes wore light coloured dresses (often white) while older ladies wore rich and darker colours. 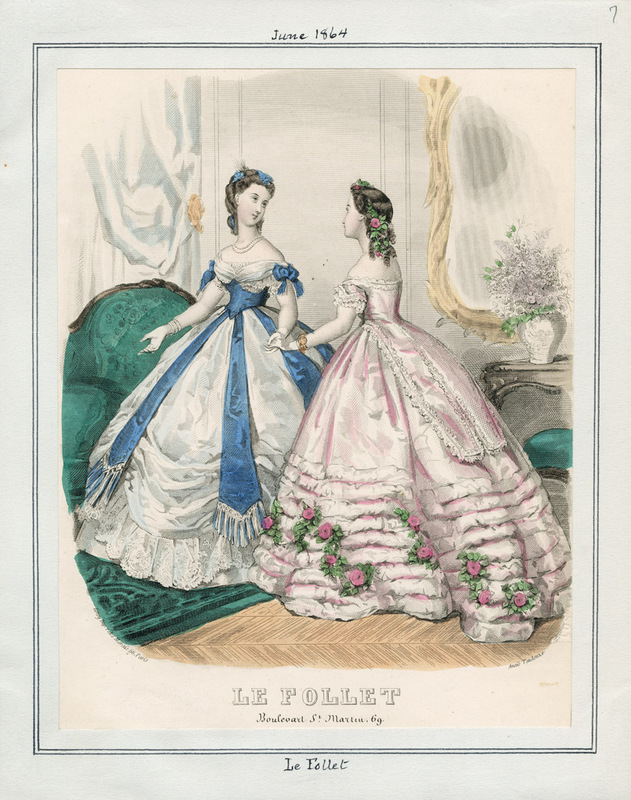 Plain coloured silks became extremely popular in late 1850s Pastel colours and dotted fabrics were popular while floral prints were saved for day and afternoon dresses. Trimmings were also very important in this period. They were usually pleated; silk, lace or satin. 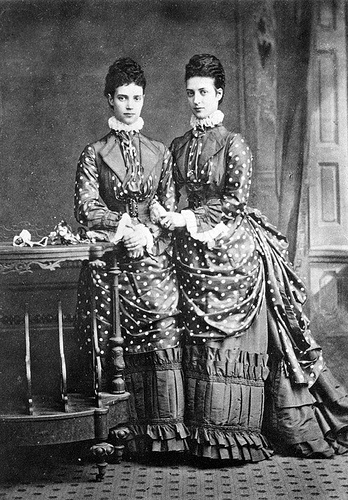 Decoration on the skirts included floral motifs, little rosettes, flower bouquets, lace, bows, roses or different flowers such as lilies, carnations, violets… For young ladies and debutantes nice choice was a plain white silk dress decorated only with white lace and bouquets of flowers or single flowers. Variations of the evening dresses were endless but I’m going to single out a few particularly popular combinations; white silk dress with sky blue, pink, turquoise or lavender trimming, pink and blue evening dresses for summer, darker colours for autumn and winter; burgundy red, dark green, purple, brown and yellow. 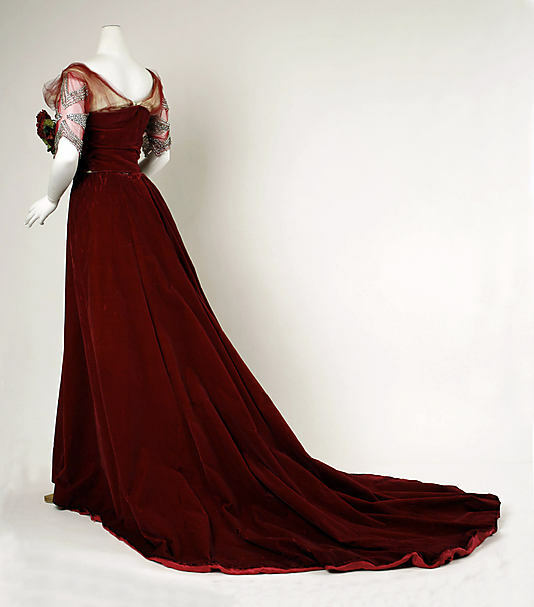 Popular combination for winter was white satin evening gown with burgundy red, black or dark green trimming. 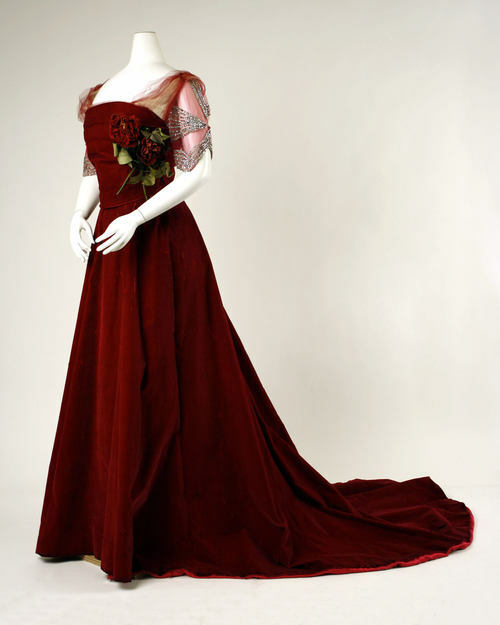 Red roses appeared to be extremely popular decoration for December’s evening dresses. These evening dresses are beautiful and full of subtle elegance. I enjoy observing all the details, noticing the pattern in colours and trimmings for particular month. 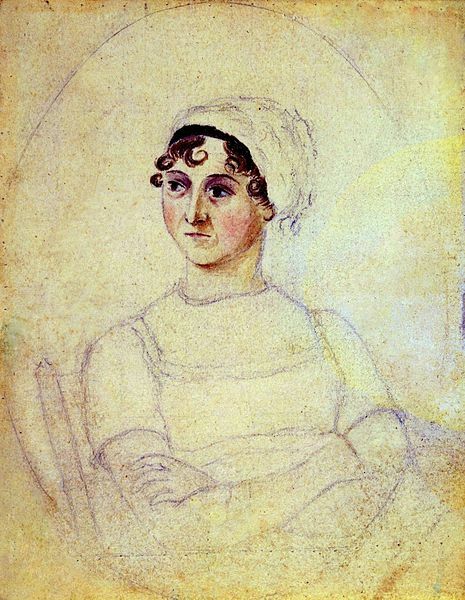 Jane Austen was born on 16. December 1775. – exactly 238 years ago! I love Sense and sensibility and Pride and prejudice and I wanted to wish a happy birthday to this wonderful lady novelist. Who knows, maybe I’ll write something about regency fashion soon. Anyways, hope you’ve read her novels and liked them too! 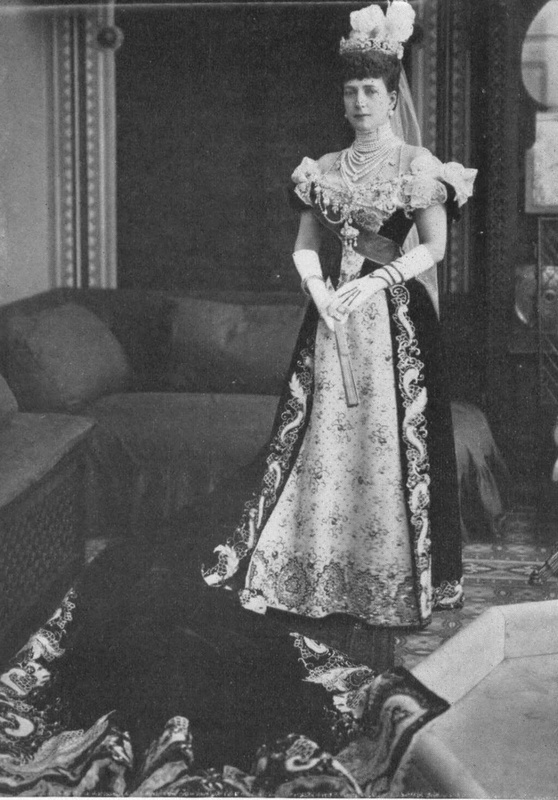 Queen Alexandra was born on 1. December 1844. – one hundred and seventy two years ago. 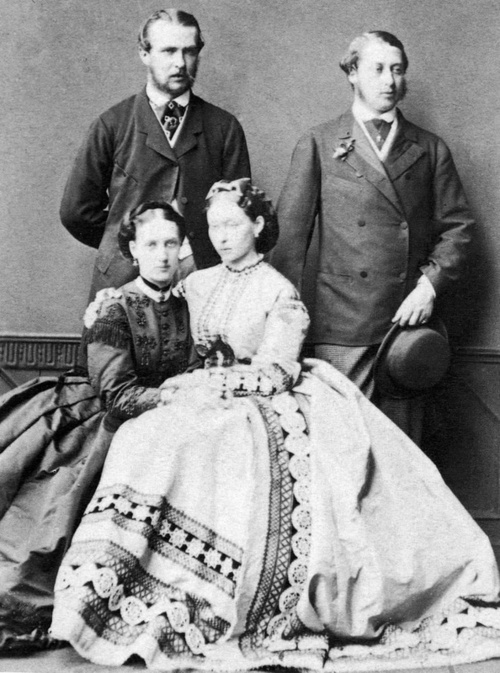 Her full name was Alexandra Caroline Marie Charlotte Louise Julia and she was a daughter of Christian IX. 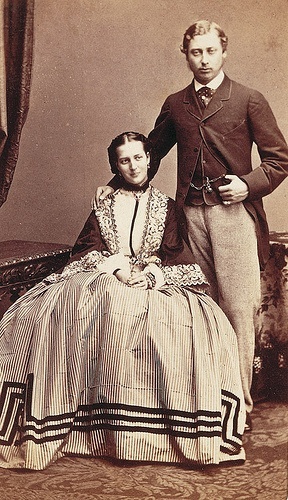 of Denmark and Louise of Hesse-Kassel. 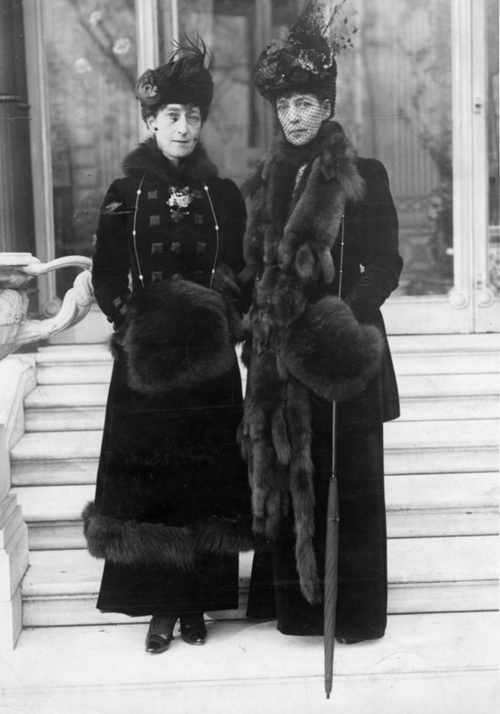 Her close family knew her as ‘Alix’ and although she was of royal blood, she lived pretty modestly and shared her attic room with her sister Dagmar (later Maria Feodorovna, Tsarina of Russia.) As a child she was taught swimming and English, and she remain a devoted christian her entire life. 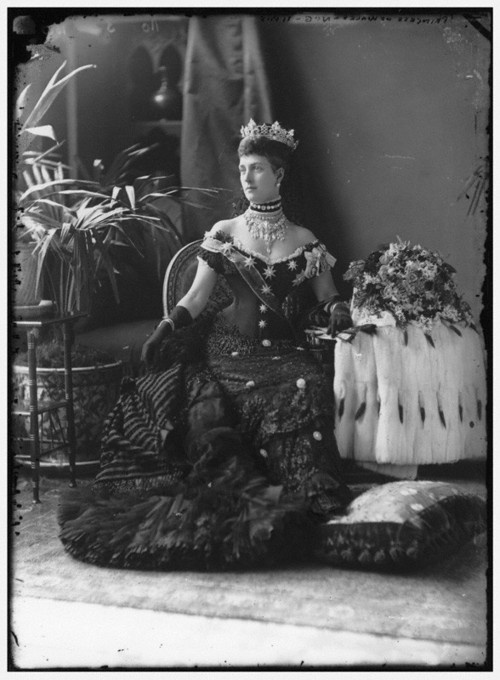 I’ve chosen a title ‘Queen Alexandra – Life in photos’ because she was an amateur photographer herself and she took a lot of photos of her children and family. She was also interested in hunting (much to Queen’s disapproval) and dancing, ice-skating and horseback riding. Alexandra was extremely socially active and she attended balls, dances, dinners, meetings, visited hospitals and orphanages. 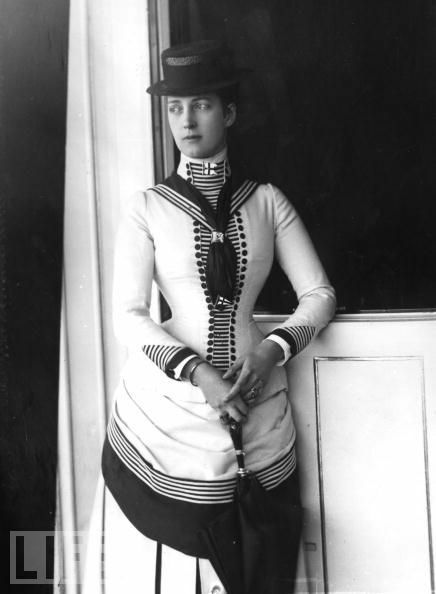 But the thing that I love the most about Queen Alexandra is her fashion style. She was a fashion icon of her time and photos of her are surely a proof. Enjoy! 1865. 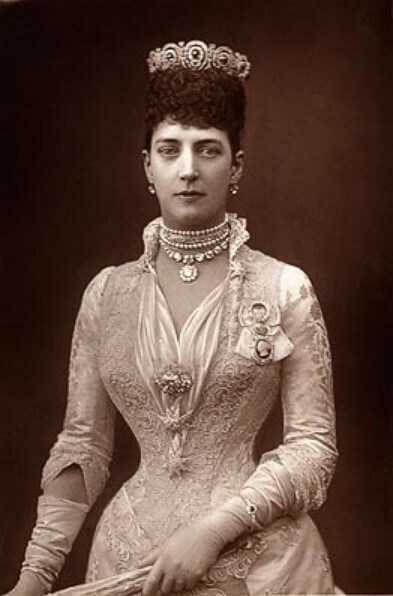 Princess Alexandra of Wales. 1867. Princess Alexandra of Wales. 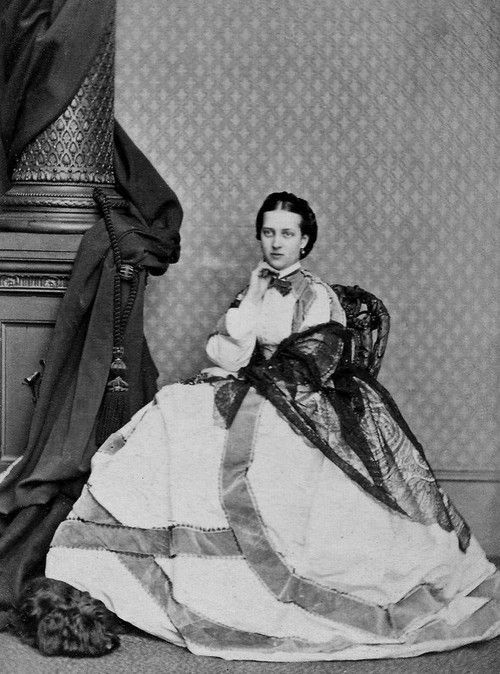 c. 1871. Princess Alexandra of Wales. 1883. Princess Alexandra of Wales. 1894. 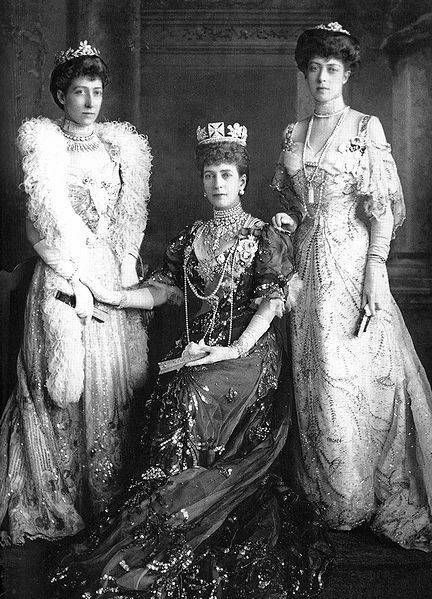 Maria Feodorovna her two daughters Grand Duchess Olga Alexandrovna, Grand Duchess Xenia Alexandrovna and Queen Alexandra with her daughter Princess Maud.